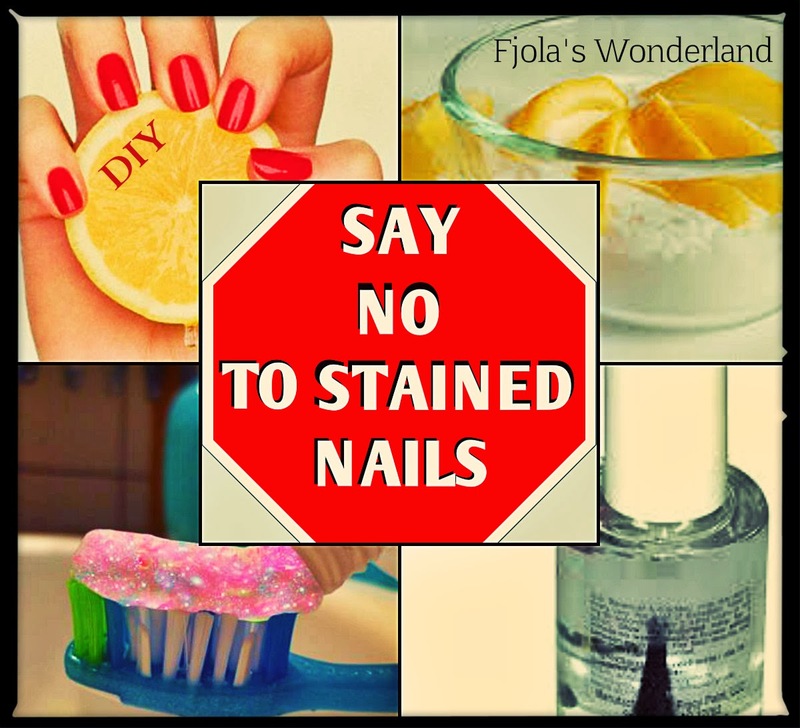 Fjola's Wonderland: DIY:HOW TO GET RID OF YELLOWNESS ON YOUR NAILS !!! DIY:HOW TO GET RID OF YELLOWNESS ON YOUR NAILS !!! All of us have been faced this ugly and embarrasment manicure once in a while in our nails life. The cause whichleads to the yellownes,of the nails, is a badly mixed nail color,painting often the nails, not using a top coat before you color your nails or poorly cleaned claws. So instead o continuing this demage to our nails by coloring themto hide the yellow appereance, we can try some really easy and cheap home solutions. All of us have lemons. Lemon juice helps to lighten nails beds. What you have to do?! Cut a lemonin some slices, then dub a few drops or the slices of the lemonto your stained nail and let set for a few minutes (10' - 20' depends the problem you have). After that buff the surface with a washdoth. Mix baking soda with lemon juice and a bit of water.Then take a toothbrash and start rubbing every nail for few seconds. Afterrubbing thenails with the mix, let it set on your nails about 30'minutes. After the 30'min buff the surface( you can use some olive oil to moisturize them later). In order to get rid of stained nails try scrubing a whitening toothpaste on your nails using a nail brush or any small brush you have. Becareful, don'tbe rough with the brsushing!!! You have to be gentle so you'll not demage your nails and your skin too. Do a light buffing to get rid of the yellowness, which is on the surfce of your nails.ATTENTION after that you MUST use a clear strenghtening nail polis, because of buffering your nails may get weak.